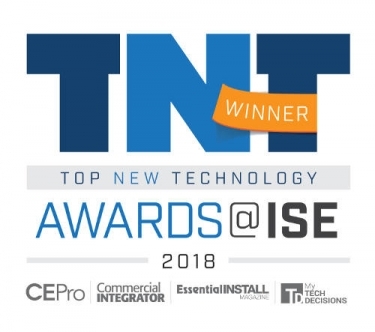 The winners of the 2018 Top New Technology (TNT) Awards @ ISE have been announced. The third-annual awards program recognizes new, outstanding products and services presented at Integrated Systems Europe (ISE) 2018 in Amsterdam. "Integrators from all around the world today operate diverse companies that cover both the residential and commercial markets. The 2018 Top New Technology (TNT) Awards can help integrators filter their product decisions by identifying the best in new technology," says Jason Knott, editor of CE Pro. CE Pro, along with sister publications Commercial Integrator, Essential Install and TechDecisions, worked with a team of judges to rate the top products and services in five residential categories and 15 commercial categories. Entrants are judged on their technological innovation, benefits to the integrator and benefits to the end user, independent from one another. Some categories may have more than one winner if two or more products received high scores. Award winners will be featured in the April 2018 print editions of Essential Install, CE Pro and Commercial Integrator, along with the corresponding websites, and on TechDecisions.com. Habitat Soundscaping – Plantronics Inc.
10.1” Touch Screen – Crestron Electronics Inc.
Matrox Maevex 6150 Quad 4K Enterprise Encoder – Matrox Graphics Inc.